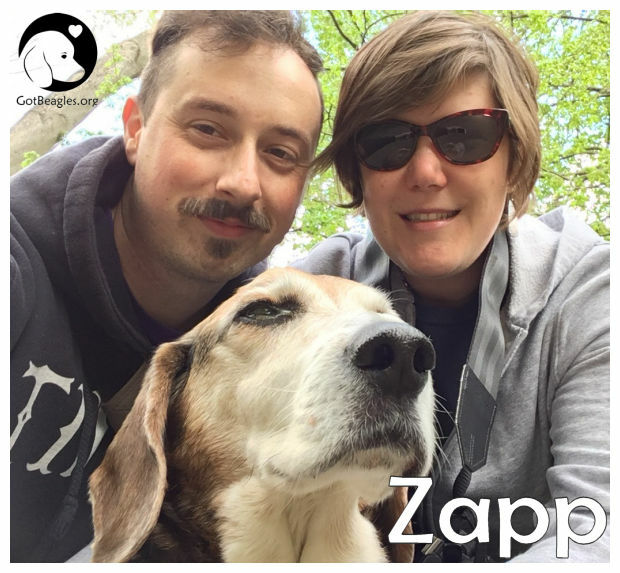 We had to say goodbye to our beagle boy, Zapp (formerly known as Leo) on May 2nd, 2017. We found out a few weeks back that he had cancer, and it progressed rapidly over the last few weeks, until he stopped eating (a big deal for him, who spent so much of his life devising plans for eating things he shouldn't!) or enjoying walks, and then we knew it was time to let him go. We already miss him so much. I wanted to thank Midwest BREW for helping to bring him into our life. We got to share the second half of his life with him, and for that we are forever grateful. He made our lives so much better and we loved him so much. He wasn't the perfect dog, but he was the perfect dog for us. We play in a band together, and we even included him in one of our recordings, and we wrote a song for him. This is the link: https://outdoorvelour.bandcamp.com/track/zapps-song. We will be making a donation to Midwest BREW in his memory.